The MT4 Power Punch EA in general uses rather large Stops and Targets. 140 Pips for the 1st MT4 Power Punch EA Positive trade was earned. So sometimes it can take a long time for trades to mature. This transaction took over 2 days to reach its target. Below is the first positive trade made using the preset provided for the GBPJPY which uses a 140 target and a 100 pip stop and a smallish trend. It shows the entry soon after the launch on Wednesday. Once a trade is active it does not open more trades until the trade has either been stopped out or has reached its target. Great British Pound currency crosses appear to be the most successful when using this EA. The MT4 Power Punch EA Forum is not password protected so both owners and non owners can visit it and participate in discussions. There has been considerable participation on the forum so it you have a question about anything about the EA please visit the forum. There is a good chance that you will find an answer there. The chart below show the transaction. The area between the blue and red lines is the area that the EA uses to assess the trend for entry purposes. 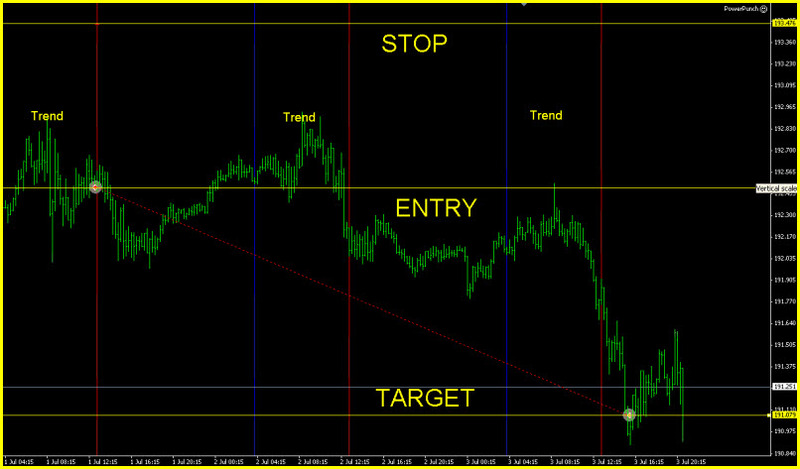 The stop, entry and exit levels are shown. Please visit the Forum for more details and a discussion about the EA.